I hope all of you had a great summer season, soaked up a lot of sun and enjoyed long warm days. 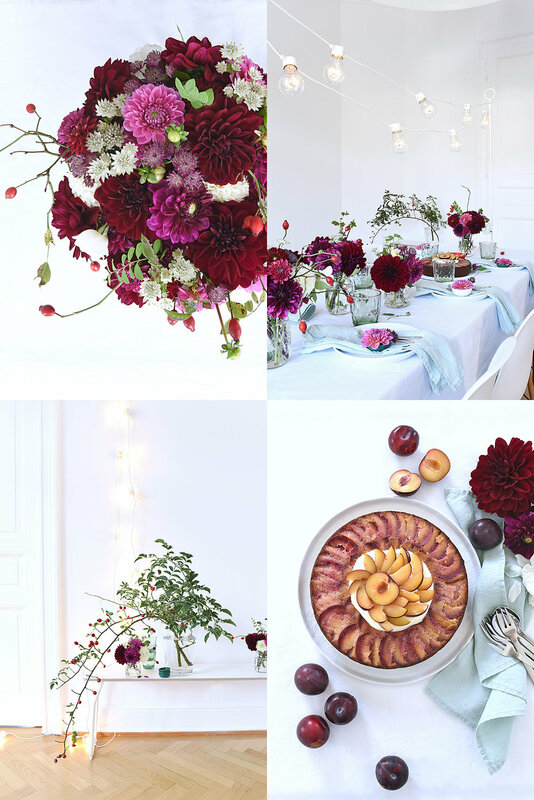 This is Anke and I am back from my month-long summer break with a new table styling for you while Holly is away this week in London and Amsterdam launching her new book, Decorate For a Party. Are you ready for autumn? I guess I am a bit ambivalent (as every year) as on the one hand I love autumn with its rich colors, warm light, fruit and veggie crop, then again I don't really want to let go summer. Happily there is the wonderful month of September which is actually always sunny and warm in Germany and makes the goodbye to summer easier. For this month's table I ordered a white chain of lights, a typical decoration for a garden party and I think also a matching tool for a late summer gathering inside. This one comes from Granit (Sweden) and can be used inside and outside. To attach the chain, which is very light and for that reason easy to hang, I used two parts of a table clamp from DEENS.nl. I continued with this simple and natural look by using Ball Mason glasses as flower vases and filled them with different kinds of dahlias, chrysanthemum, white bush roses, Astrantia and rosehip twigs. On the plates are mint green linen napkins and tiny blossom bowls. Another discovery recently was Bernadette Wörndl's cookbook "Obst" (= fruit). I knew immediately that I would have to bake one of her delicious fruit cakes for this shoot! My choice fell on her Upside-Down Plum Cake and oh my! - it just tastes of late summer! No wonder as the recipe includes olive oil, blossom honey, vanilla and semolina. I served it with some crème fraîche which I sometimes prefer with cake instead of whipped cream.